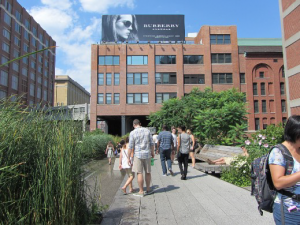 The High Line | Custom & Private New York Tours, Inc. Formally this mile plus long elevated freight railroad line transported goods from West 34th Street to Clarkson Street in The West Village. It fell into disuse in the early ’80’s. It was abandoned and became a blight; a place for the homeless and other unsavory people to hang out. Mayor Giuliani wanted to disassemble it. Rather, two locals formed “Friends of The High Line” and after ten years of effort and over $100 million it has become a magnificent urban park. With some tracks intact, lush plantings, most-modern benches, art and more it has become a magnet for development and a wonderful place to stroll and relax amidst a colossal building boom. You must do this! You never know what you’ll see up there! Signs, surprises and terrific views. No dogs, tobacco or bikes, thank you!